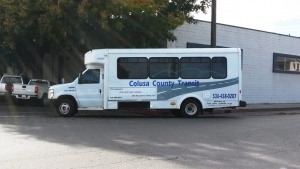 Colusa County Transit provides lifeline transit service in major communities in Colusa County. All rides on Colusa Transit require reservation. Call (530) 458-0287 to arrange rides. Routes are operated on a flex route basis where the bus would pick up riders by request in one city in a given time window before departing to another city. Last buses leave from Colusa and Williams to other cities sometime around 5pm to 6pm in the afternoon. Fares are $1.50 (in town), $2.00 (intercity), and $3.50 (Yuba City). Fares for child age 2 to 5 are $1.00 (in town), $1.50 (intercity), and $1.50 (Yuba City). Colusa Transit connects with other transit or intercity transportation providers in Yuba City. This page was last edited on 10 April 2018, at 17:11.